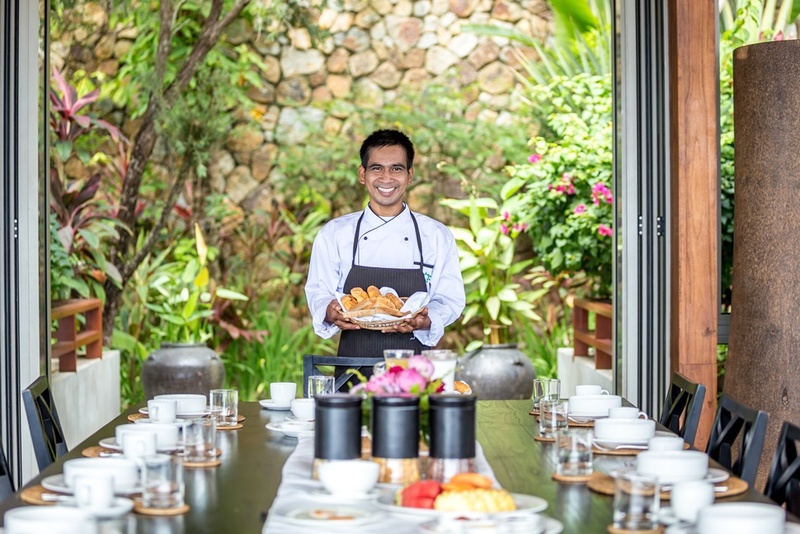 "a surprise around every corner"
Ban Jakawan is a very large seven bedroom property, but it's more than just another high-end villa. The thought and detail which has gone into the layout, not only maximises the outstanding views, but it also creates a home which continues to excite and amaze you as you walk around. Set high on the prestigious and exclusive Narayan Heights development, you approach the property by a private wall-lined road. The villa itself is entered via large wooden doors and the attention to detail starts from the minute those doors are opened. Directly ahead is a distinctive water feature and the first glimpse of the extensive tropical landscaping. The property pans out to your left so, as you turn, the first feature is a large Sala styled carport and to the left of that is the driveway for several cars. 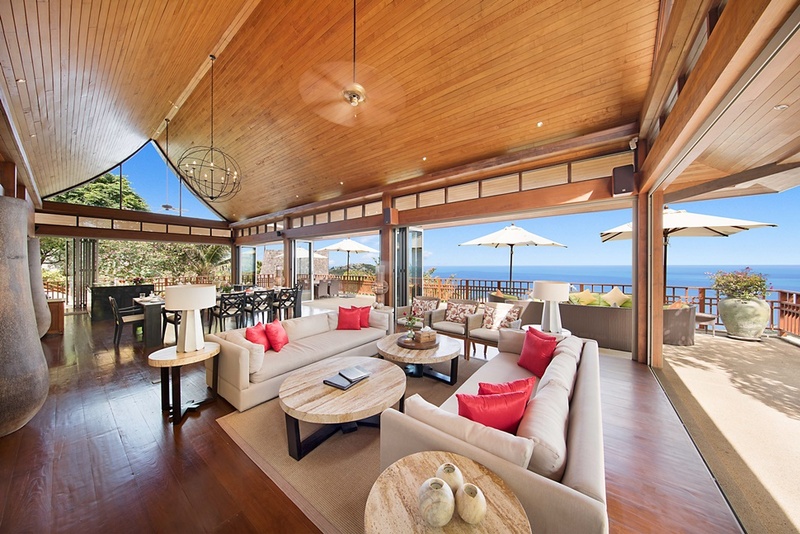 In front of the driveway is another large Sala, this one is set up as a comfortable and relaxing lounge area to take advantage of the views from such an elevated position and of every cooling breeze. 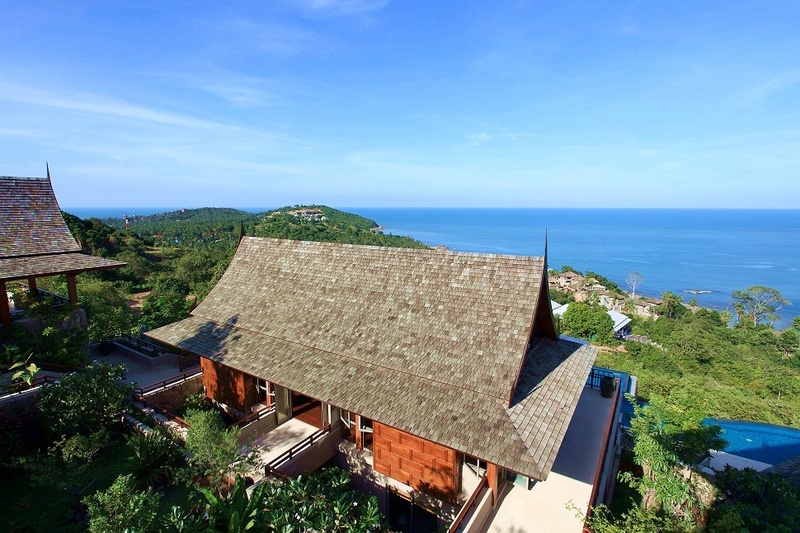 From here you can see that all the pavilions which make up this property have wooden shingled Thai temple-styled roofs, giving the property an almost regal appearance. 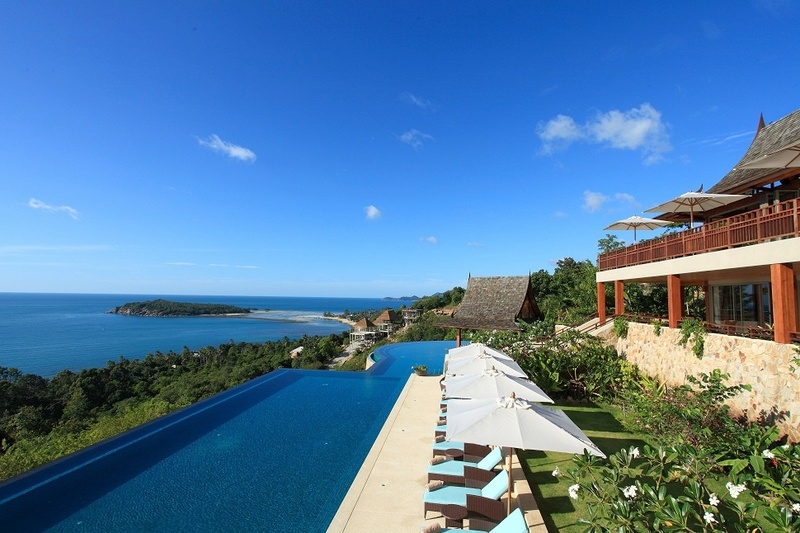 And by now you'll be aware of the high quality of the design, the finishes and the furniture that fills this villa. To the right of the Sala is a garden which leads past the car port and to the highest placed pavilion. 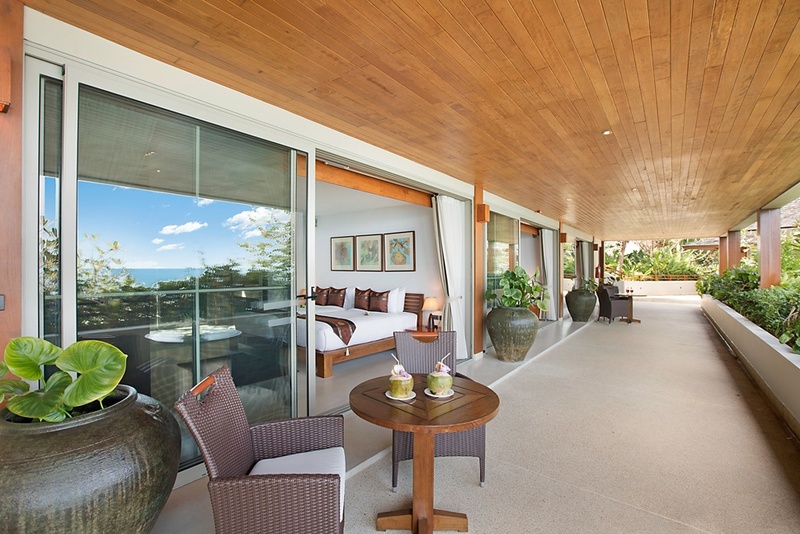 Large steps lead up to the bedroom suite above a covered viewpoint lounge terrace and down to the rest of the property. 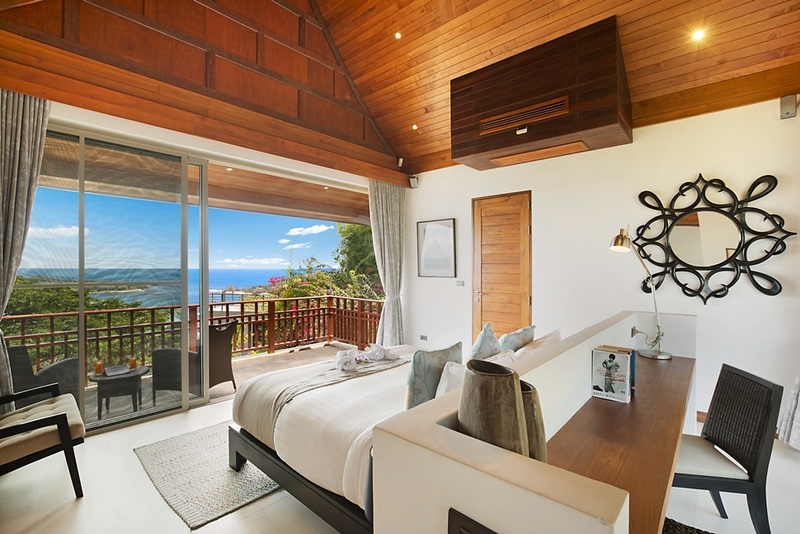 The bedroom suite has incredible views from balconies at the front and back with lush mountain views behind, sea views over Choeng Mon to the left, and a fantastic sea view over to Koh Matlang straight ahead. 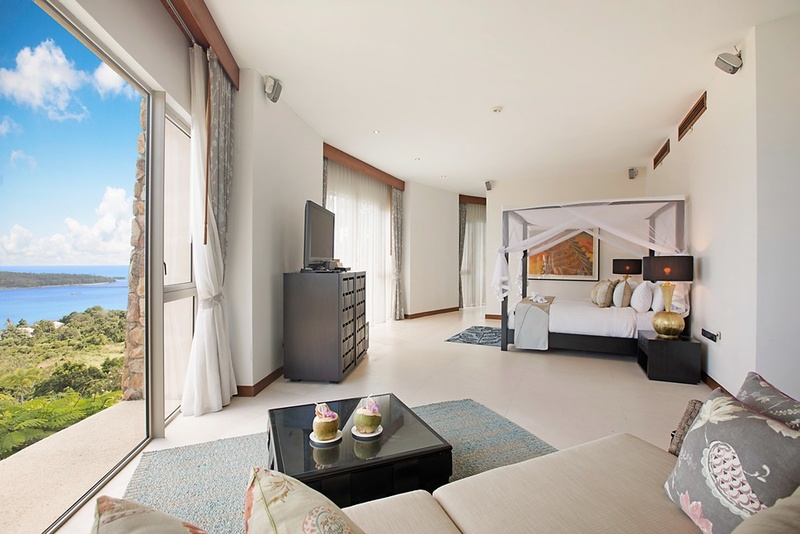 The room features a high-vaulted, wooden-lined ceiling with ceiling fan; stylish modern furniture, including a desk and reading area; a double bed; a separate dressing area; and an en-suite bathroom with free standing terrazzo bathtub and walk-in shower. As in all the other bedrooms, there is a flat screen TV, safe and split level airconditioning. Below this room is a large versatile open terrace area which acts as the perfect viewpoint. Steps lead down to the next level and, as you walk along, you'll notice that the external decorations are equally as impressive as those used inside: oversized vases and planters; wall hangings; traditional Thai wooden panelling; natural stone walls; and most strikingly the plants and garden areas which line the walkways. The main central pavilion is a wide functional room with a high vaulted ceiling complete with ornate chandelier and ceiling fans. This open-plan room houses the fully fitted western kitchen; a comfortable seating and relaxing area; the dining area complete with a dining table with seating for twelve people; and the luxurious lounge area with comfy sofas, chairs and a large wall-mounted flat screen TV. To the rear of the room doors open out onto a bridge which leads across to a private landscaped garden. 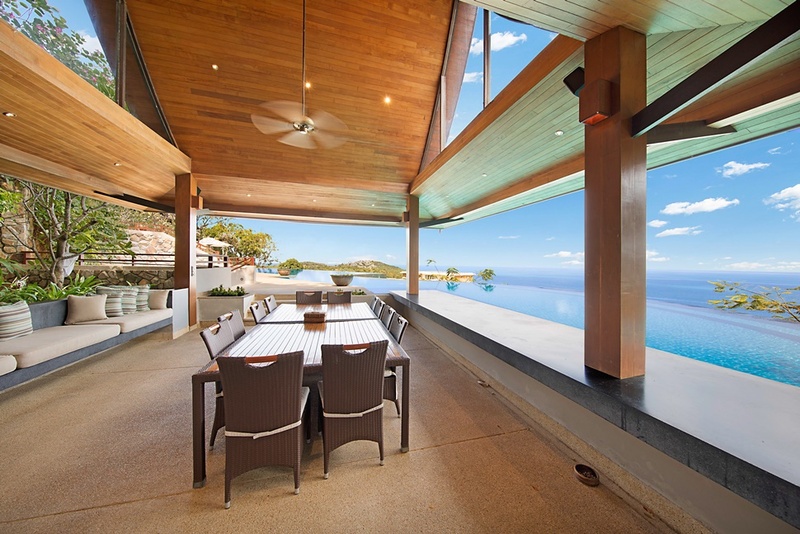 At the front there's a wall of glass doors which open out onto the enormous viewpoint terrace which has comfortable seating and another dining table for ten people. With additional tables and chairs from the pool sala his number can be increased to twenty. Steps on either side lead down to the next level. 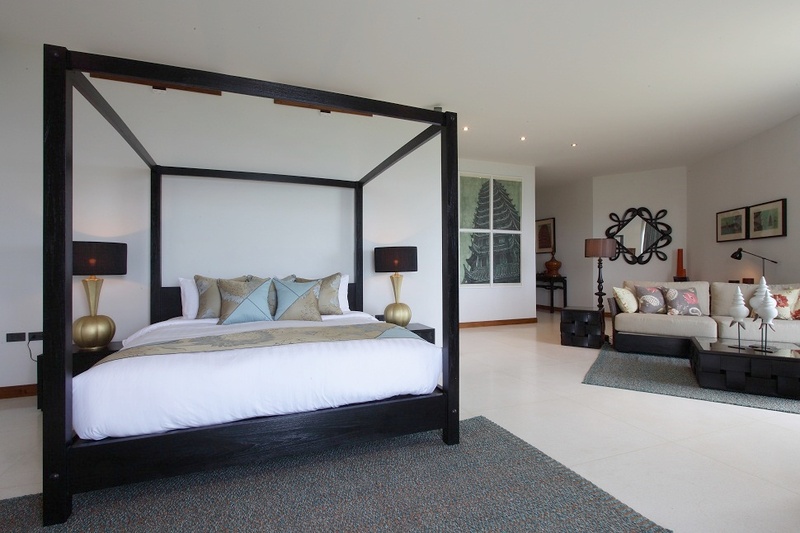 Underneath the main living room there are three en-suite bedrooms which complete the central pavilion. 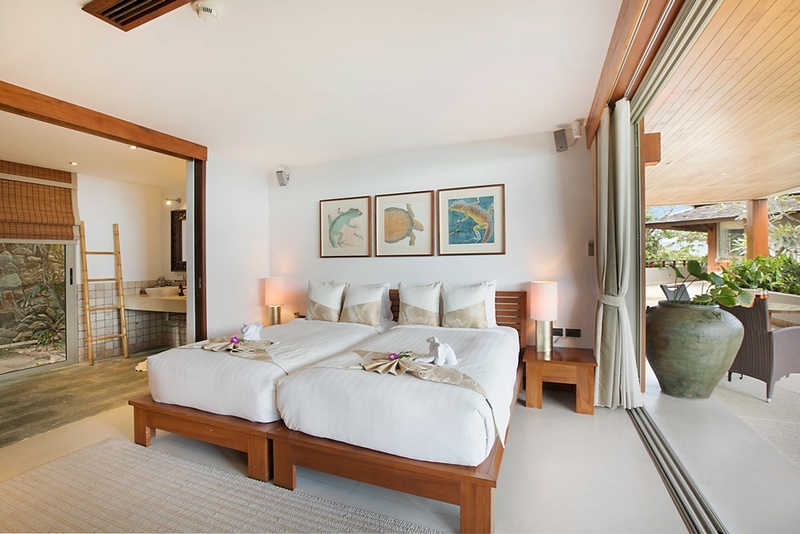 A sea view terrace runs across the front and each of these identical rooms features built-in wardrobes, flat screen TV and safe. A heavy wooden sliding door opens to reveal the exquisite en-suite bathrooms with walk-in showers, twin sinks and stylish tiling effects. Each en-suite also leads out into a private garden courtyard area. 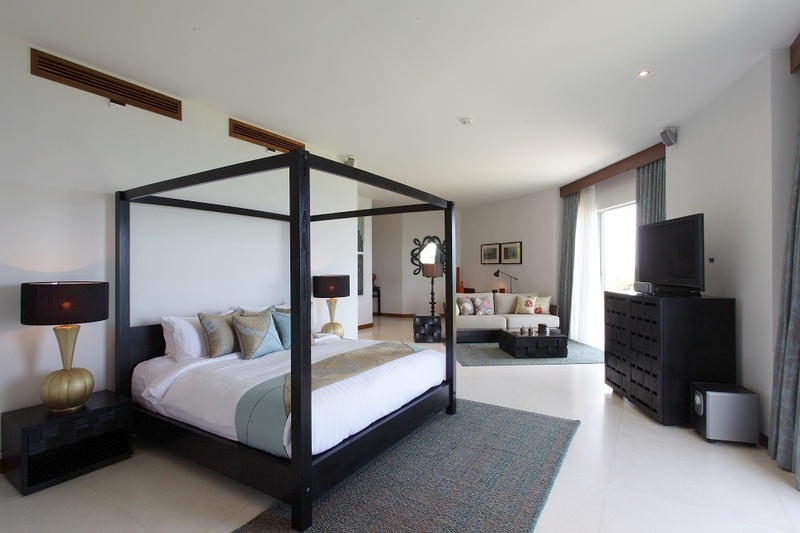 Each of these rooms has been fitted with twin beds and each has an individual colour scheme. From the bedroom level, steps lead down to the pool level and garden. On the left of the property there's a further pavilion housing two more en-suite bedrooms. 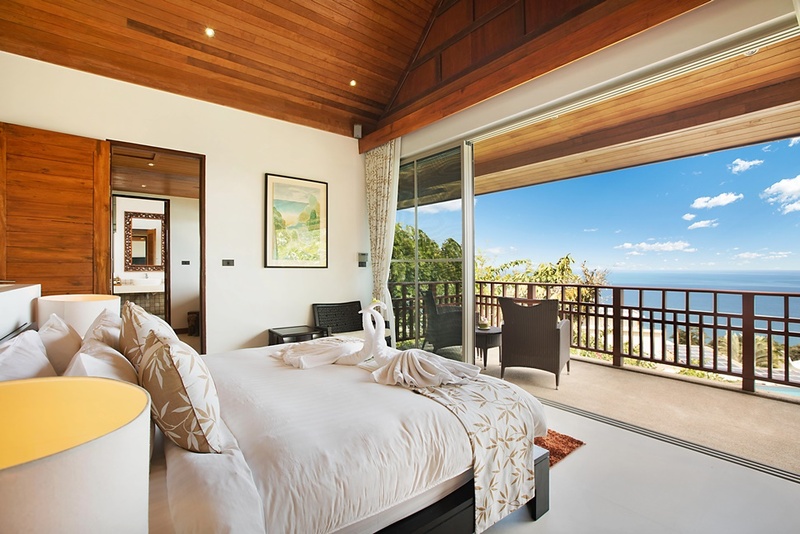 Both these suites, situated one on top of the other, are laid out in the same way as the first bedroom with desk; separate dressing area; double bed; and viewpoint bathroom. One has a free standing terrazzo bathtub and shower, the other has just a walk-in shower. 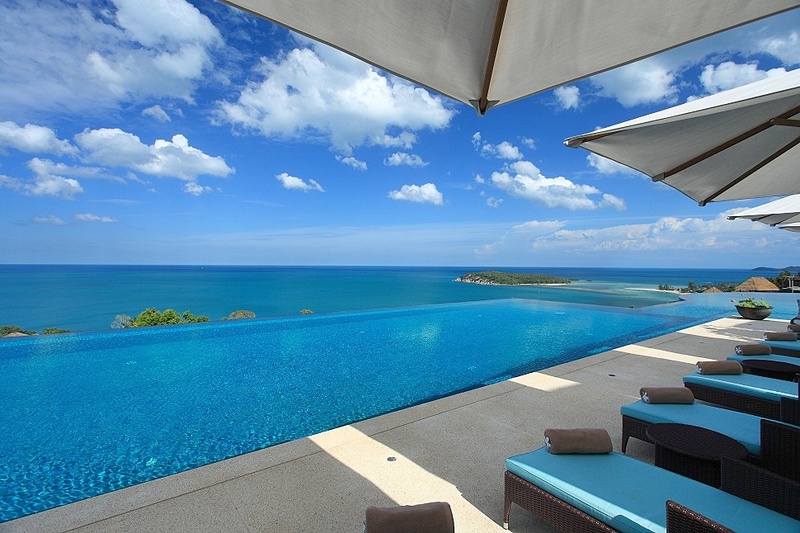 These rooms look out across the infinity pool to the extraordinary views beyond. As you leave the lower suite there's a little pathway leading along the side to a natural stone walled and private, covered, almost cave-like sitting area. This cool space is the perfect escape from the heat and also leads into a secret garden feature. This private garden runs behind the suite and is also accessible from the bedroom. Back in front of this pavilion steps lead down the side of the pool to yet another well landscaped and large garden space. 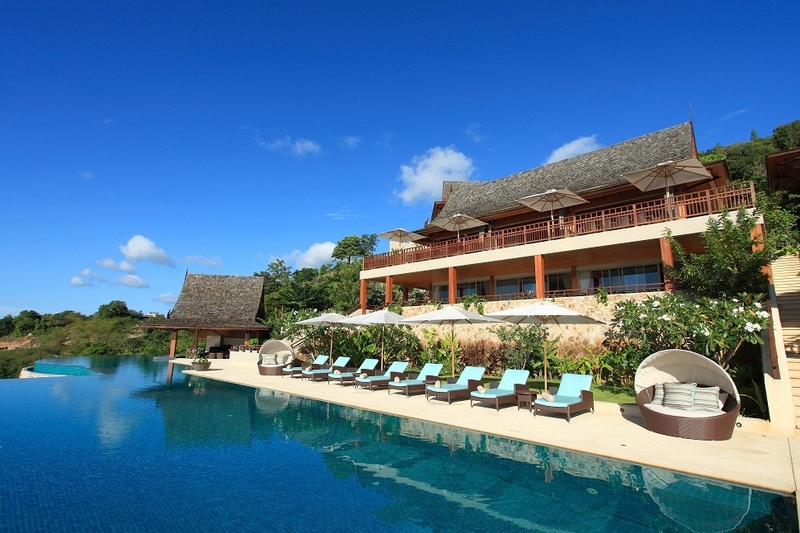 The pool terrace separates the central garden from the pool and has comfortable loungers and furniture from which you can really enjoy the sun and the overall atmosphere of the property. The infinity pool is breathtaking, not just because of how the edge invisibly merges with the sea, but also because of its sheer magnificence and unusual shape. 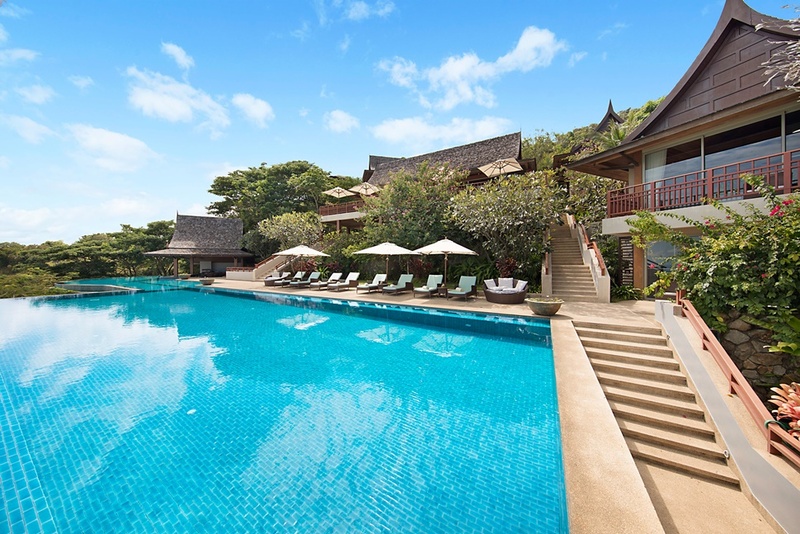 This is a vast swimming pool which starts off as a rectangular pool, centrally positioned within the grounds, but then there's a narrower strip linking the main pool with a spectacular round pool which is split in half by a further pavilion with Thai temple-styled roof. 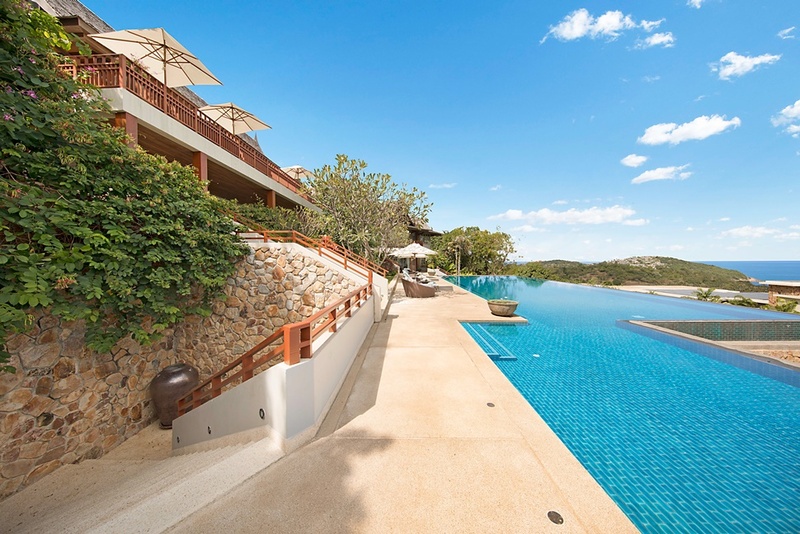 This pool sala has a swim up bar, a large dining table and a full kitchen with grill. 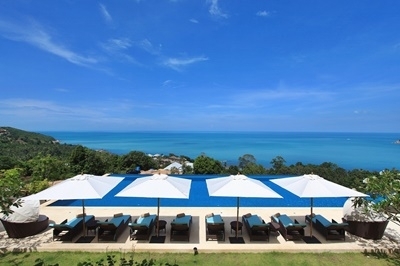 The outside dining furniture from the upper terrace can be added so that the sala can seat up to twenty. 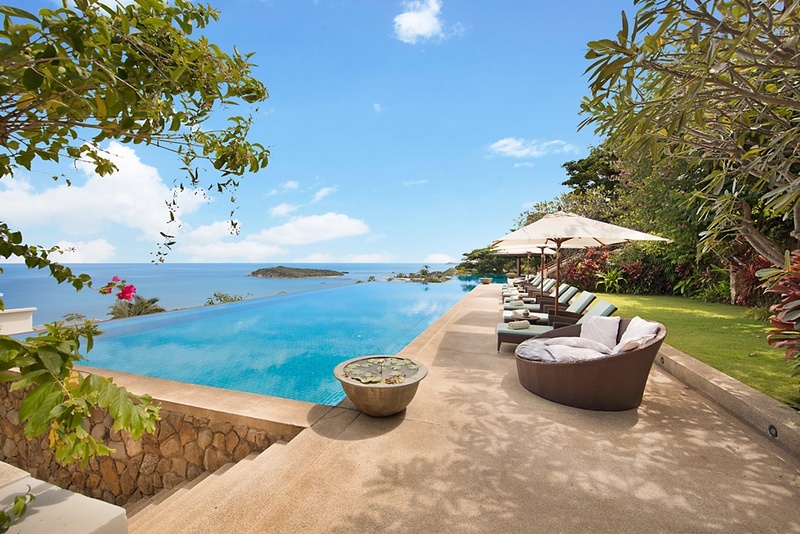 Just when you think you've seen all that this incredible villa offers there's one more surprise left. 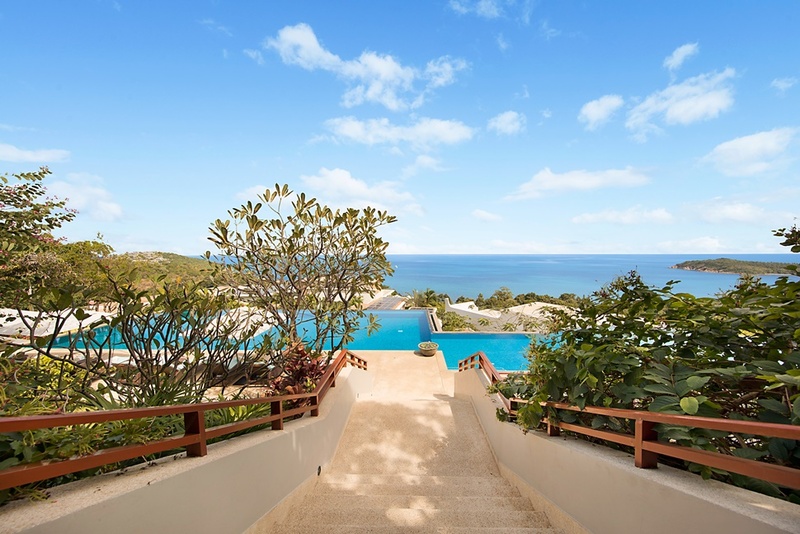 A further staircase leads below the pool bar and down to a reception hallway. 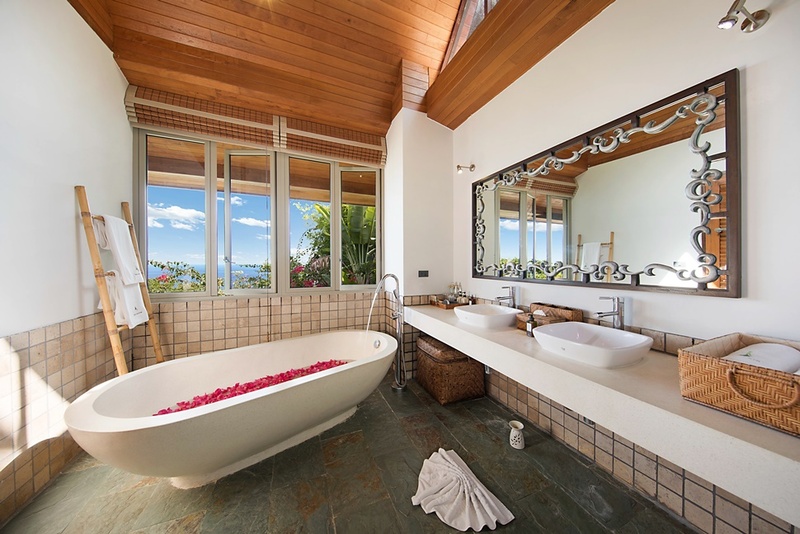 The first door leads to a guest bathroom whilst the second opens to reveal an astonishing master-suite. A private hallway guides you into the semi-circular room which follows the shape of the pool above. The room opens into a well furnished sitting room and bedroom with a sofa and stylish four-poster bed which is positioned facing the large windows. Behind the bed is a separate dressing area and at the furthest end of the room is the sublime en-suite bathroom. Twin sinks face a large free-standing terrazzo bathtub and beyond that is an open wet room with a corner stone seat and four showers. This final room really is a case of saving the best till last and totally sums up this imaginative villa. Literally every part of this large property has been incorporated into the living space and everywhere has a function. 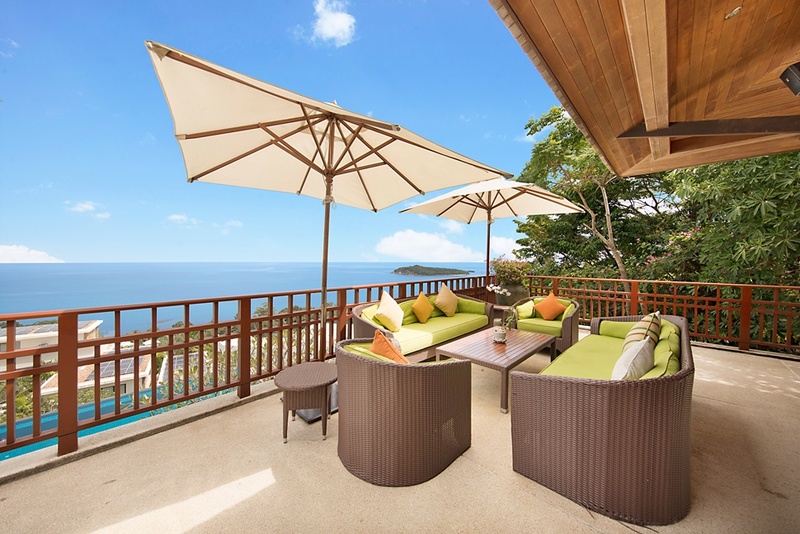 Even if that function is simply as a private, secluded space in which to sit and relax, it is after all is one of the most important features of a holiday. 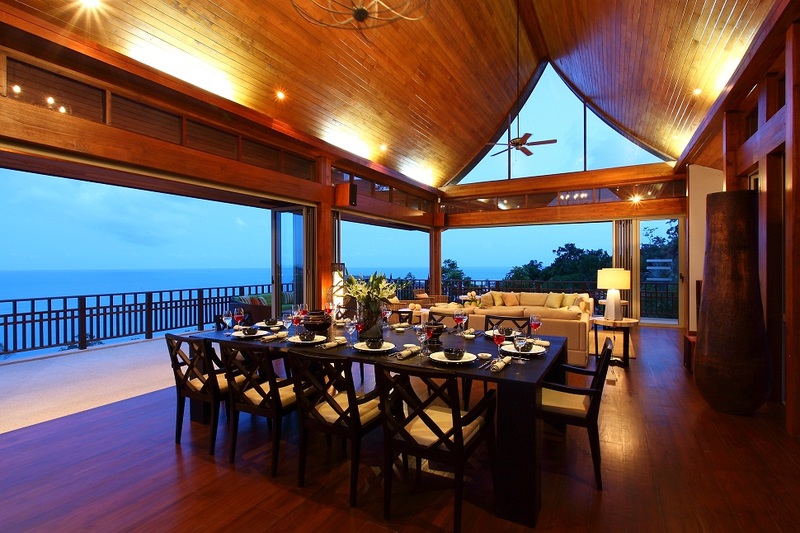 This villa has a very stylish yet comfortable ambience. The gardens and tropical plants are extensive and extremely eye-catching; there are even nametags on many of the trees and flowers. 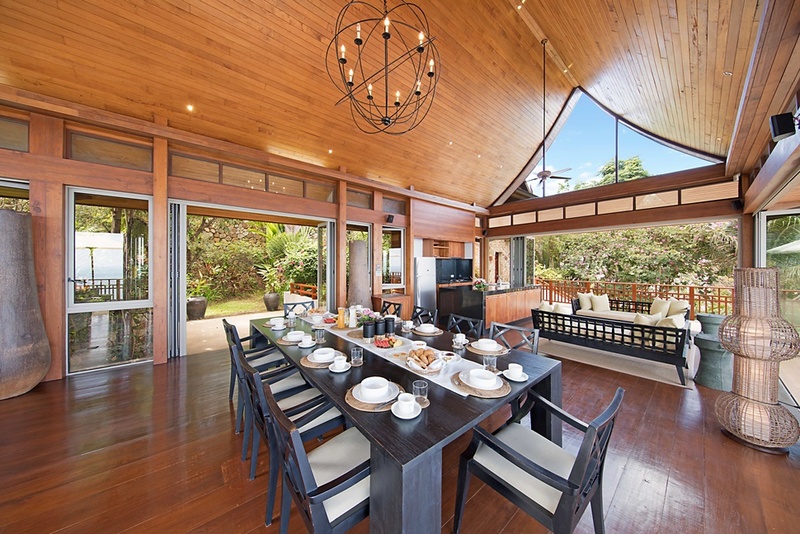 The use of natural materials works well with the traditional features such as the wooden temple-style roofs and exterior panelling, and yet it's also a very modern property with contemporary furniture, high quality powder-coated aluminium window frames and all the latest in audio-visual technology. Hot water is provided by solar heating. 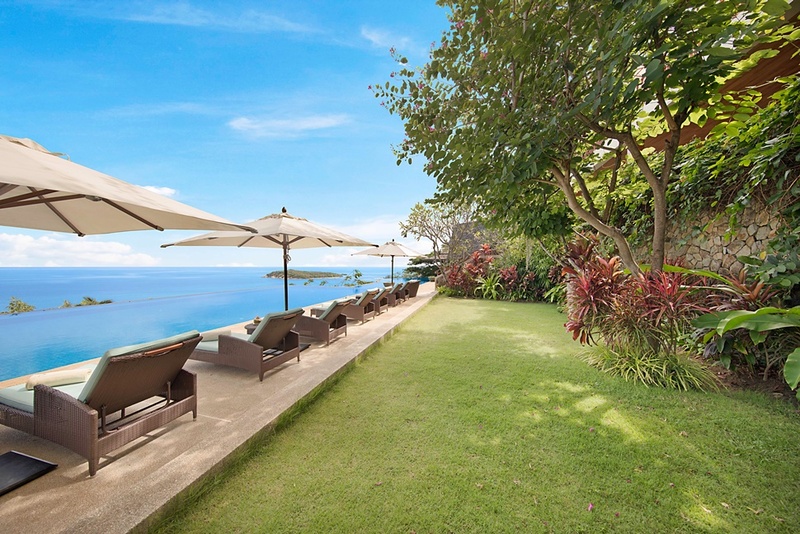 With six bedrooms and so many private areas within the lushly landscaped grounds, this is the perfect villa for friends and families to share. It allows you to enjoy the company and still escape into your own space whenever you need to do so. 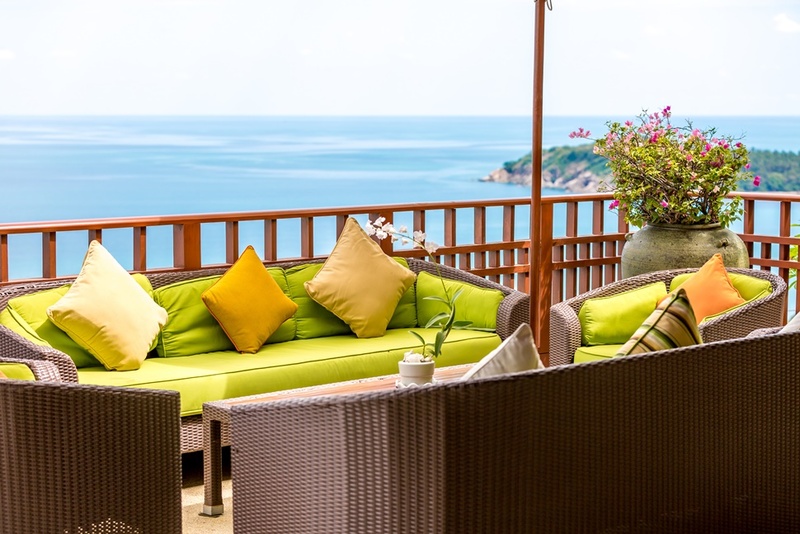 When you consider the accommodation available here, together with the stunning sea view location, this is undoubtedly one of Samui's premier places to stay. 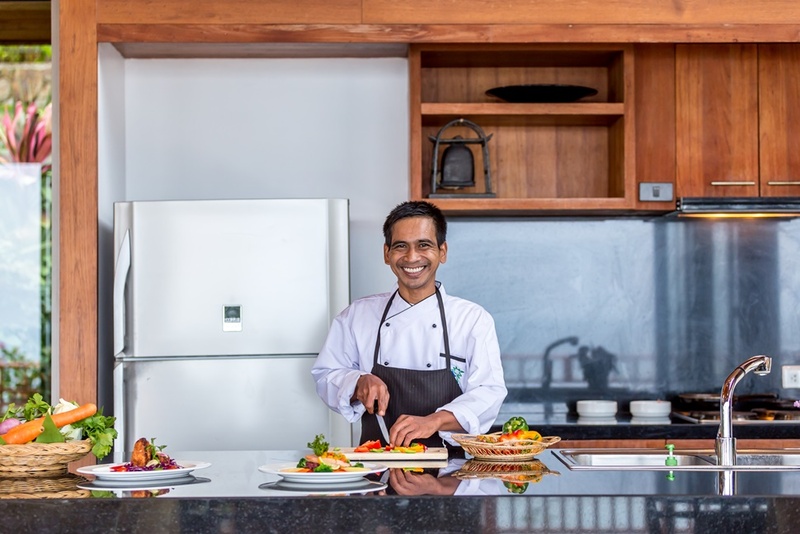 Daily rates from US$ 1,150 to 2,900 depending on season.